At our last Vocational Building Trades, HomeBiEd, Board meeting longtime board member Bill Christensen announced he will be stepping down from his seat. Mr. Christensen has served on the board an amazing 36 years, promoting building trades and supporting the process by which Cañon City High School students design and build houses. In his resignation comments, Bill said, "I would have to say I was a pretty young pup when I joined. I came on the same year Matt Micci joined as our teacher." He added, "It has been a marvelous journey. Just to think that each year in the fall we start with a raw piece of dirt and with the help of our students, teachers, and contractors, by May the next year we have a home completed!" There have been over 40 homes built by our HomeBiEd program, and Mr. Christensen has been on the board for most of them. Bill believes the program has changed the lives of hundreds of students for the better because they acquire skills that last them the rest of their lives. In addition, while he participated in the program it provided so many places for "people to dwell in, make their home, and memories too." Thank you, Mr. Christensen, for this outstanding service to our district! Two weeks ago, Cañon City High School teacher Sharon Schott received special recognition for her commitment to foster cross-cultural understanding, combat racism, and promote social justice through her Language Arts Classes. Sharon Schott was recognized for fostering cross-cultural understanding, combating racism, and promoting social justice through Language Arts. At Monday's Board of Education meeting, Garrett Olguin was named Lincoln School of Science and Technology's next Principal. Garrett said, "I can't tell you how excited I am to be joining the Lincoln team next fall. I want to thank the members of the screening committee and interview panel for giving me the opportunity to pick up where Tammy DeWolfe will leave off. My wife and my children are very excited to call Lincoln home. For my wife, it's a return to her elementary school alma mater!" Garrett added, "please know I fully recognize how important this leadership change is to your school. Not many buildings have consistent leadership to the tune of 14 years! I will do everything in my power to be transparent and communicate clearly in an effort to make the transition seamless." Congratulations Mr. Olguin! Also at Monday's Board of Education meeting, Instructional Technology Coordinator Dan Coppa reported on the district's use of the Schoology platform. Schoology is the learning management system we adopted when we set out to put Chromebooks in the hands of all our students. Mr. Coppa said that since August Cañon City students have 57,485 assignments, uploaded 27,482 files, posted 34,397 comments, and have viewed just under 2.7 million pages. This is amazing considering only Cañon City High School and McKinley Elementary students are currently making use of it! Finally, on Monday evening, the Cañon City Board of Education voted 4-1 to approve our new calendar. This action culminated nearly a year of effort by many folks involved in the Interest-Based Solutions process this fall and the District Calendar Committee this winter. Comments made by the board at the time of the vote included thanking community members who reached out by email, in person, and by attending the public comments session to share their opinions about the calendar. When casting his vote, Board President Larry Oddo requested district administration chart data for the next three years related to staff and student attendance, student achievement, local juvenile crime rates, how effectively professional development early release days are being used, and the level at which the district receives applications for open positions in comparison to the past three years. Dan Coppa presents Schoology use to the Board. I promised him we will do that. Board Vice-President Lloyd Harwood was the one dissenting vote, stating "I have personally been a proponent for a 4-day week for a long time and would prefer we just go ahead and adopt a traditional 4-day week calendar." "The fact is there is a significant teacher shortage, and I'm not sure this goes far enough to address that." Board Treasurer Shad Johnson reminded everyone, "none of these decisions were made without a tremendous amount of thought about how this will impact staff and kids. Last year it could have been very easy to just say let's switch to a 4-day calendar. I think this is groundbreaking work." As is often the case after big decisions are made, there is still a lot of work to be done. In the next several months we’ll work with our association leaders to ensure we align master agreement language to our new calendar, and as promised, with our primary interest being nobody loses out on annual compensation as a result of this change. 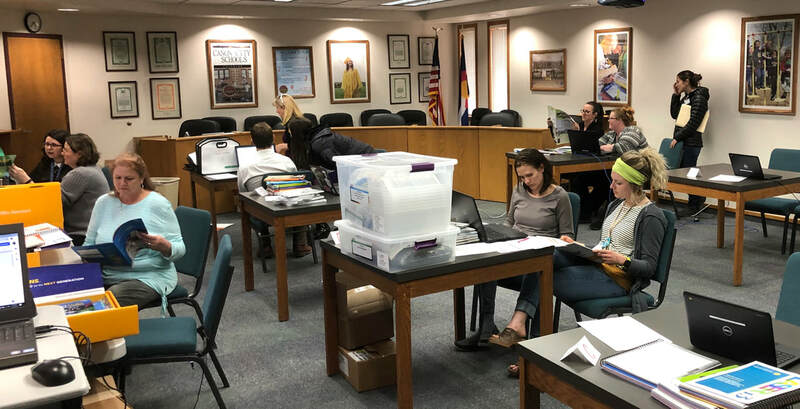 K-5 staff reviews updated science resources. A major advantage of putting Chromebooks in the hands of every student is having the ability to take advantage of the many digital curriculum resources no available. This week Assistant Superintendent of Schools Adam Hartman solicited the help of K-5 science staff to sample and review materials we may decide to invest in as an update. The old CCMS Home Economics Room will become the mechanical hub of the new school. Last week demolition took place on the old Cañon City Middle School home economics classroom. It is being gutted to make space for all the mechanical equipment that will operate the facility through the various construction phases, both new and restorative. This week we also lose the West parking lot at CCMS bordering 12th street. Early in April ground will be broken there to build a new Commons, 8th-grade wing, and life-skills classrooms. This will be quite disruptive for parents and staff. Starting after Spring Break our current bus lane on the east side of the campus will change to parent drop off. Buses will now drop off on Main Street right in front of our campus. I'm including a site map illustrating our current traffic plan. The area where parents can drop off students is highlighted in red. Parents will want to enter this pull through from 14th Street. Staff and school event parking will now be limited to 12th and Greenwood Streets, shown in yellow. Meanwhile, on the site where our new grounds shop/electronic recycling-repair shop is being built stem walls have been erected, plumbing rough-in is done, and crews are starting to backfill the foundation with stable soil. Groundwork won't begin on the Washington Elementary site until early June. Thin yellow zones are for parent and staff parking, the bold red zone is for parent from off of students, the bold yellow zone is bus pick up and drop off. We started last week at Washington Elementary to conduct an annual on-site review. Afterward, I attended a board work session and meeting and then the Cañon City High School Choir spring recital. On Tuesday I had a touching base meeting with Director of Student Support Services Paula Buser, and then one with her and the Cañon City Police Department. We then held our weekly Superintendent Advisory Council meeting, and I attended an expulsion follow-up meeting. Next, I had a Harrison leadership touching base meeting, a District Leadership Team meeting, a Communities That Care Key-Leader gathering, and finally a monthly touching base meeting with certified association leaders. On Wednesday I started the day with a classified association touching base meeting and then a monthly Department of Human Services FIOG meeting, a legislative advocacy phone conference, and a meeting with our architect. On Thursday I attended another legislative advocacy phone conference, a student Chromebook repair program establishment meeting, and ended the day hosting our second Civic Canopy community engagement meeting. On Friday I planned the CCMS groundbreaking ceremony, met with Pam Walker about a potential expansion of preschool services and spent time working on building review written reports. Good progress is being made at our new grounds facility. The school district will be on spring break this week and I'll spend a little time working at the office and at home. My major tasks include finishing CCMS and Washington site review reports, attending a phone conference about potential mill levy equalization legislation, attending the monthly Fremont County Manager's meeting, catching up on office correspondence, finishing director evaluation paperwork, touching base with Stacie Kwitek from DHS, finalizing next year's bus transportation plan, and working on how we'll support elementary teachers when their kids get Chromebook devices during the 2020-21 school year. 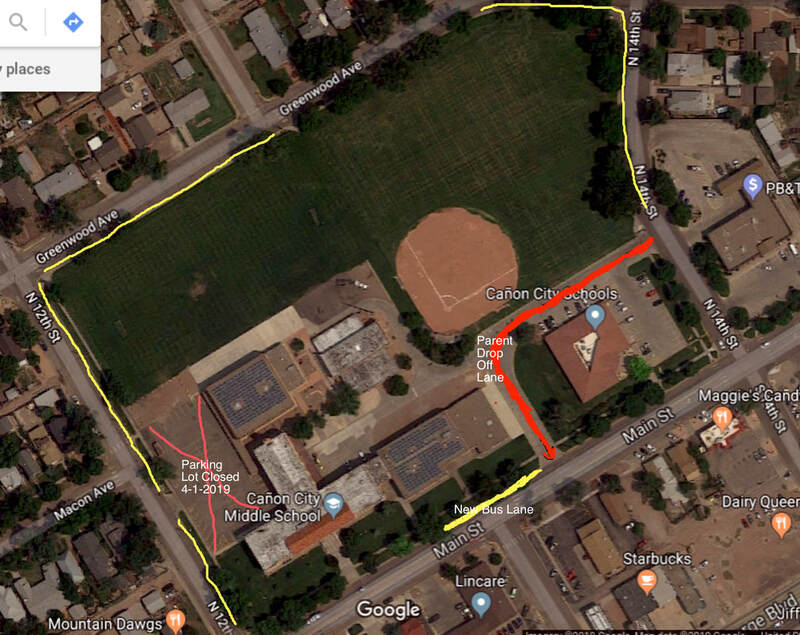 Cañon City Schools staff member Pam Hamby would like everyone to know her family is hosting a Drunk Driving Awareness Walk on Saturday April 13th beginning at 9 AM at Veteran's Park here in Cañon City. All funds raised will go to benefit Drunk Driving awareness high here in Fremont County. The event is held in memory of Brieonna Sanders-Samora, who sadly lost her life to a drunk driver in 2018. What a great way to honor the memory of a loved one! Thanks for listening again, and have a wonderful Spring Break!